Yes, you will. It won’t be often, but it’ll happen! Common sense and protective gear will greatly diminish your chances of getting stung. Place your hives in a quiet corner of the yard that doesn’t receive much foot traffic. Facing the entrance toward a wall, fence or hedge will force the bees to fly up and over, putting their flightpath well above human (and pet) height. For tips on safe hive placement, click here. 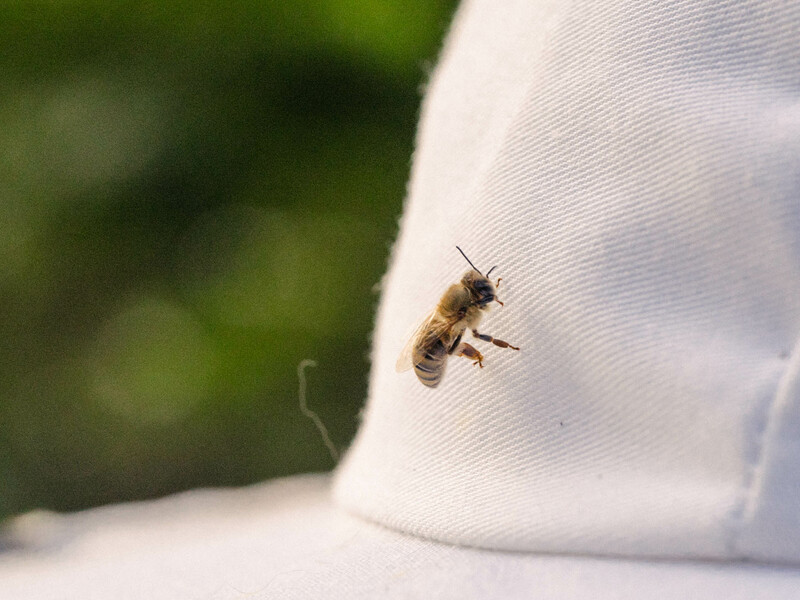 Be sure to wear appropriate safety gear during inspections, or when you need to do something invasive near the hives (mowing, weed whacking, etc.). Use common sense when choosing hive inspection times. Never open hives at night, during rain or extreme temperatures (hot or cold) or when your neighbors are having a dinner party next door! Populate your hives with gentle genetics and requeen colonies that display aggressive behaviors. Some bees are just plain mean and no amount of responsible beekeeping will help. Stay calm! If a bee lands on your or is flying nearby, they are likely just curious and have no intent to sting you. 80% of the stings we witness are due to people totally losing it when a bee is nearby, as swatting and quick movements can trigger a defensive reaction. If a bee lands on you, stay still and let it explore for a second; it’ll probably fly away once it realizes you’re not made of sugar. If a bee is buzzing around you and seems irritated, slowly walk in the opposite direction until it loses interest. If you DO get stung, take a deep breath and immediately remove the stinger to cut off the flow of venom. If you are able, put ice on the sting right away. This, more than anything else we have tried, lessens the pain and subdues the future swelling and itching! Antihistamines are helpful, and plantain leaves and lavender essential oil are reported to be helpful, as well. Swelling, soreness, and itching are all perfectly normal responses, but if you are experiencing a systemic reaction (difficulty breathing, chest tightening, etc. ), please seek immediate medical attention. We do recommend identifying any serious allergies in your household (and nearby neighbors), and it is never a bad idea to have an EpiPen on location for emergencies. A final thought… As a beekeeper, it’s important to learn not to fear stings. You need to be able to keep your cool in tricky situations; panicking never helps and often results in more stings. You’ll see seasoned beekeepers working hives without protective gear, and it's not because they stop hurting - they just know what to expect and how to read their bees. As your skills and confidence increase, you may choose to use less gear. Until then, do what makes you comfortable and confident around your hives!